92-96 Buick LeSabre Custom Sedan 4-Door (93 94 95). 92-96 Buick LeSabre Limited Sedan 4-Door (93 94 95). Example: 92 Honda Civic. Side: driver side. Specs: front, plastic, driver side. For further information checkout ourFAQ's. 1987-1989 Buick Lesabre Sedan. Condition: New Other. This May Fit Other Vehicles, Years, and Models. Notes: Out of original box. May have minor imperfections from storage and handling. Overall in excellent condition. 2002 Buick LeSabre 4 Door Custom 3.8 V6. Driver Fender with Bolts. Vin # 1G4HP54K424184020. Fender For 2000-2005 Buick LeSabre Front Passenger Side Primed Steel. 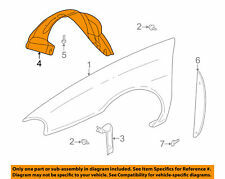 2000-2005 LESABRE L. Make Sure to read below on condition of this Driver Side Fender. Our staff inspects each Driver Side Fender and gives it a condition code. This Driver Side Fender condition codes are. 2000-2005 Buick LeSabre. In order to keep our prices low, we have the following purchasing policies 18:00PM 9:00AM. We're here for you!